Responsive web design is a method of designing and coding websites that means they look great and function correctly across all devices. A website built in a responsive way adapts to the size of the screen using proportion based grids and adaptations of the CSS file. 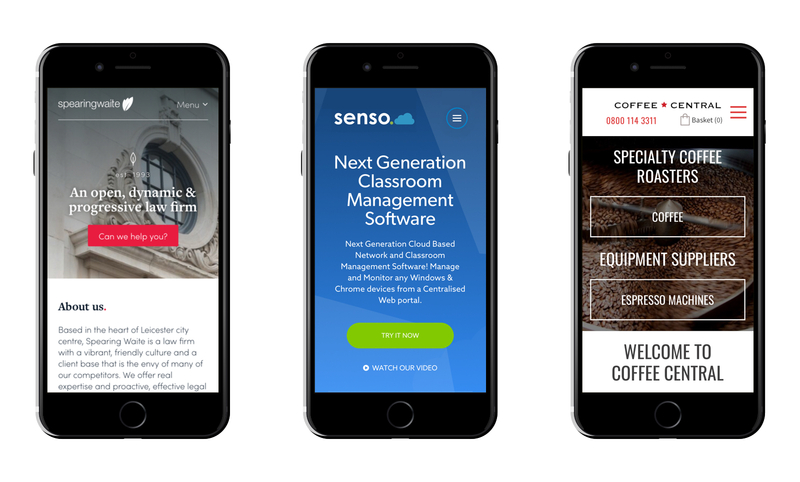 Responsive websites are typically designed and built “mobile first” — our user experience designers plan user journeys based on your target demographics most popular devices, to ensure they receive the best mobile experience possible. Although most websites can be altered and retrofitted in order to work well on mobile devices, this approach is not nearly effective as creating a website under this methodology from scratch. Aside from scaling well and functioning properly on small screen devices, mobile-first websites scale well onto devices of any size and employ best practice compression and minification of their component parts to ensure load speeds are as fast as possible. As a digital marketing agency, we focus on a number of aspects of a performance website build which design-only agencies might not; site speed, compression, lead-generation or sales performance, marketing automation integrations and much more, all of which feed into more effective search engine optimisation (SEO) (‘responsive’ being the web design approach recommended by Google) and make for a greater ROI on your website. If you want to be sure your website will look great and function correctly across mobile, desktop and tablet devices, choose Impression as your responsive web design agency. We adopt a mobile first approach to all the websites we design and develop. By taking a mobile first approach, we ensure that mobile users are catered for, as opposed to mobile being a ‘stripped down’ version of a desktop implementation. Of course, this doesn’t mean desktop users are missing out. Indeed, the array of screen sizes on which we view the web is growing all the time so by taking a mobile first approach and extrapolating out, we ensure that users are always met with a positive online experience, regardless of screen size and resolution. Practically speaking, a mobile-first approach to responsive web design means considering the smallest screen first. We’ll work closely with you to understand the most important elements of your site architecture and to agree the user journeys that are best aligned with your business goals. All prototyping and wireframing work is done across a range of resolution sizes so you can see how your website will flex and adapt as screens shrink and grow. Our in-house responsive design and development specialists will design and build your website in such a way that users across all devices are well catered for and that their journeys are optimised for conversions. As we’re also a multi award winning digital marketing agency, we’ll QA your website with our expert search engine marketers to validate them against expected performance – meaning your new site is set up for search success from day one. When you host your website with us, we also set up a number of server, database and content delivery networks smarts which sped your site up even more. We’re always happy to geek out on what’s possible so please get in touch if you’d like to know more! Since 2014, Google has been imposing changes to its algorithms which favour mobile-friendly websites. Since 2018, Google has been indexing more websites based on their mobile performance over their desktop performance, and this trend is set to continue. That change was an important move by the search giant and proved how essential mobile experience is in today’s online world. Websites which are built in a responsive way are now much more likely to outrank non-responsive or non-mobile-friendly websites in the search results. We’re experts in designing and developing performance websites that help you achieve your goals. We’d love to discuss your next project with you; get in touch using the form below and a member of our team will get back to you as soon as possible.